Countdown To Jupiter Has Officially Begun! June 16, 2016 – On July 4, NASA will fly a solar-powered spacecraft built by Lockheed Martin Space Systems within 2,900 miles (4,667 kilometers) of the cloud tops of our solar system’s largest planet. As of Thursday, Juno is 18 days and 8.6 million miles (13.8 million kilometers) from Jupiter. On the evening of July 4, Juno will fire its main engine for 35 minutes, placing it into a polar orbit around the gas giant. During the flybys, Juno will probe beneath the obscuring cloud cover of Jupiter and study its auroras to learn more about the planet’s origins, structure, atmosphere and magnetosphere. 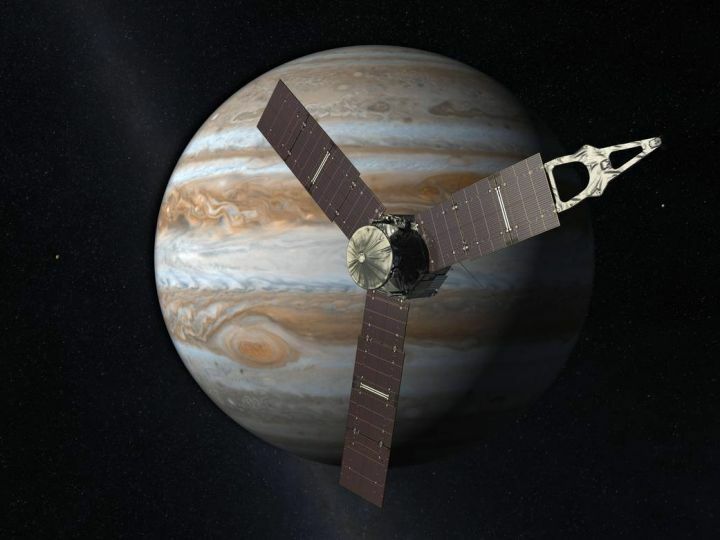 “Over the life of the mission, Juno will be exposed to the equivalent of over 100 million dental X-rays,” said Rick Nybakken, Juno’s project manager from NASA’s Jet Propulsion Laboratory in Pasadena, California. Juno’s orbit resembles a flattened oval. Its design is courtesy of the mission’s navigators, who came up with a trajectory that approaches Jupiter over its north pole and quickly drops to an altitude below the planet’s radiation belts as Juno races toward Jupiter’s south pole. Each close flyby of the planet is about one Earth day in duration. Then Juno’s orbit will carry the spacecraft below its south pole and away from Jupiter, well beyond the reach of harmful radiation. While Juno is replete with special radiation-hardened electrical wiring and shielding surrounding its myriad of sensors, the highest profile piece of armor Juno carries is a first-of-its-kind vault, containing the spacecraft’s flight computer and the electronic hearts of many of its science instruments. Without the vault, Juno’s electronic brain would more than likely fry before the end of the very first flyby of the planet. Titanium was a good choice of material for radiation tolerance, but the vault still weighs in at almost 400 pounds (172 kilograms) and will reduce radiation by 800 times, but will not block it completely. The quantity and energy of the high-energy particles is just too much. However, Juno’s special orbit allows the radiation dose and the degradation to accumulate slowly, allowing Juno to do a remarkable amount of science for 20 months. The Juno spacecraft launched on a United Launch Alliance Atlas V rocket on August 5, 2011 from Cape Canaveral, Florida.